ExplorerzNigeria is at it again. This time we have something bigger and way more interesting. 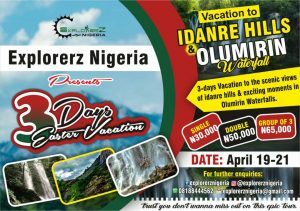 Our tour is heading to the scenic Idanre Hills in Ondo state & the Olumirin Waterfalls in Osun State. You see, there comes a time in our life when you need a vacation. Now, this is not just an ordinary vacation, its one that brings us closer to our history and culture!!! Wait for it, as this year’s vacation promises a lot of adventure. With 660 steps to get to the top of the wonderful and 800 years old Oke Idanre, this year’s adventure is one you do not want to miss. The picturesque and breathtaking view of the town at the top of the hills is the perfect motivation to get to the top. Our tours are the perfect way to explore nature’s wonderful bounties and of course, connect with interesting people at the same time. Do not miss out on this amazing opportunity!!! Fee cover: Breakfast, snacks, drinks, entrance, ExplorerzNigeria face caps, games and more.